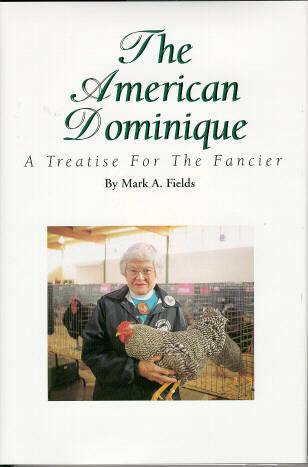 This is the only book ever written that is devoted exclusively to the Dominique breed. This book is the culmination of 20 years of research, spans more than 200 reference items and is written by one of the country’s foremost breeders of both large and bantam Dominiques, Mark A. Fields. The 352-page book is printed on high-quality acid-free paper and has a hardback, cloth covered binding reminiscent of books published in the early 1800s. To prevent unnecessary wear on this fine covering, a four-color dust jacket is included. The dust jacket is highlighted by matching photographs of Carol Voter, recently deceased authority on Dominiques. One picture is Carol Voter with a male Dominique and the other with Carol holding a female. A quick review of the Table of Contents reveals chapters on varied topics such as: Origin of the Dominique, Comparison to Other Breeds, Genetics, Bantams, Folklore and much more. The chapters are generously supplemented with high quality photographs and many pieces of historic artwork. Several items included in this book have not been seen by the general public for almost a century. We have sold out of the black and white reprints of The American Dominique. There will be no more books available until the second edition is available sometime in 2018.